What Makes a Good AAI Team? The Handler must possess the skills and knowledge required to visit people in various types of facilities. It is critical that handlers have an interest in people and enjoy visiting, even in noisy, crowded environments. The handler must also have good control of, and communication with, their animal. The animal should have at least a basic level of training so that they are reliable and under control, even in crowded situations and when there are loud noises. They should convey the image that they are well-behaved and have good manners. 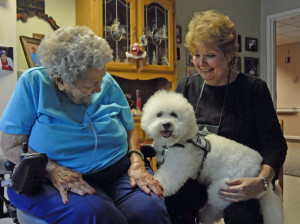 It is important that animals that participate in animal-assisted activities/therapy have an interest in people and enjoy visiting. The animal should also actively solicit interaction with people and accept differences in people’s reactions and behavior. 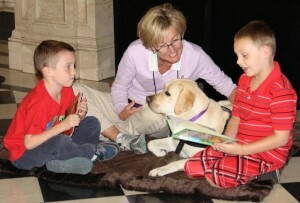 In evaluating potential therapy teams, Pet Partners assesses both skills and aptitude for doing therapy work. This ensures that the animal has the necessary training to ensure that they are controllable and have the aptitude necessary to remain predictable and reliable in a variety of situations and settings. The handler must also demonstrate social skills and aptitude for working with a variety of people in different settings. The success of a visiting animal program depends upon the ability of a handler and their animal to work together as a team. Please review the attached checklist to determine your potential for being successful as a therapy team. Although this is not the same as an actual assessment, it may point out some behaviors which may present issues in becoming a successful therapy team with your animal.